Sometimes, the best thing about baseball is that during the regular season there’s always another game tomorrow. For the Cardinals, after a brutal sweep at the hands of the Rockies, their next tomorrow couldn’t come fast enough, but fans and scribes everywhere weren’t sure what to expect coming into yesterday’s game against the Astros and Bud Norris. 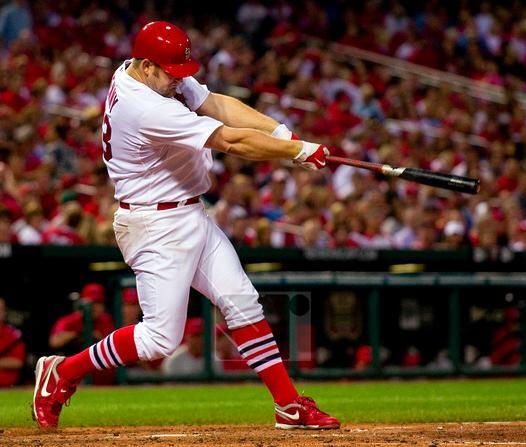 Norris had been inexplicably dominant against the Cardinals… right up until last night. Eight shutout innings by Adam Wainwright and eight wild runs by the boys in red helped everyone find serenity last night! The Cardinals have been wrapped up in their fair share of craziness already this season. Today we thought we’d look back at the good, the bad and the strange. Ready? Here we go! I’m sure you didn’t expect the first ‘bad’ game to be a win. 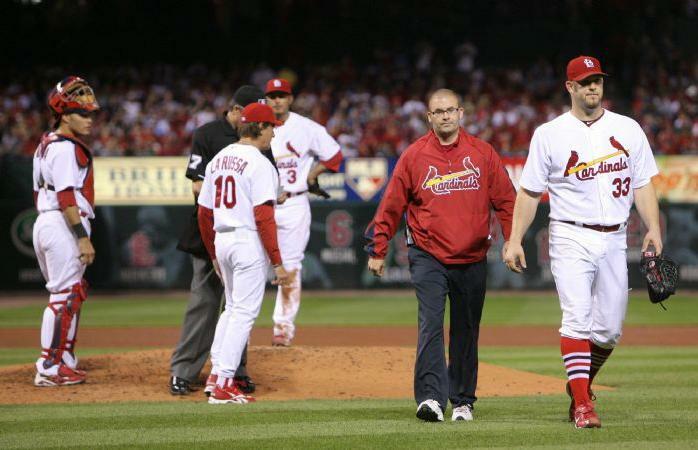 However, after shocking everyone (including himself) with a third inning grand slam, Cardinal fans watched in horror as Brad Penny went out in the next half inning and, after throwing a couple of warm-up pitches, was quickly ushered off the field by the training staff. He hasn’t seen the mound since. The team might have won the game, but was losing Penny worth it? What on earth did Adam Wainwright have to do to win this game? Here’s what he did do: give up 4 hits and 1 run over 7 dominant innings, walking 1 and striking out TWELVE. To add to the madness, the Cardinals actually outhit the Padres 7-4, but couldn’t figure out how to bring any of those baserunners back around to home plate. It was a frustrating start to a strange six game road trip to San Diego and Chicago. What could possibly be worse to a fan than seeing your team give up a huge lead in the ninth inning? Watching them do it all over again the next day in the eighth and ninth. Salt? Meet wound. Both games were so winnable. The bats were getting things done and the baserunners were going crazy. Fans were lauding Matt Holliday and Jon Jay for having big games at the plate, seeing so many 2 out RBI’s and stringing hits together in a way that we haven’t seen in weeks. Then, everyone watched in horror as the strong bullpen fell apart and some bizarre defensive positioning and play let to back to back walk-offs for the Rox. It was a horrible 2 days in Cardinal Nation. The Fox Saturday game of the week provided fans with almost 7 hours of listening to Tim McCarver spout nonsense as the Cards and Mets clashed for 18 innings of no-run baseball, a 19th inning in which both teams scored exactly 1 run, and the Pond Scum finally pulling ahead to stay in the top of the 20th. 19 pitchers battled through the game that never seemed to end, including appearances by both Felipe Lopez and Joe Mather. 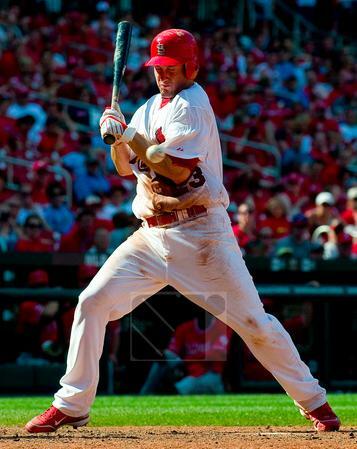 Skip Schumaker had 10 plate appearances. Brendan Ryan, who pinch hit for Jaime Garcia after 7 innings of 1 hit ball, had six plate appearances. At the end of the game, fans couldn’t decide whether to just breathe a sigh of relief that it was over, or agonize over enough missed opportunities to cover a week’s worth of games. In a game where the team was playing with an extremely short bench, Adam Wainwright became player of the game, and all he did was walk to the plate in the bottom of the 9th with instructions to bunt. A throwing error on Waino’s bunt scored Jaime Garcia (who was pinch running for Yadier Molina), and after a weak groundout by Randy Winn, Skip Schumaker came up with runners on second and third. He slapped a ball to the first base side, and Adam LaRoche threw wildly to the plate, allowing not only Brendan Ryan to score, but Adam Wainwright to swipe home plate as well! If you want the definition of a gift-wrapped win, that was it. After Erika had the gall to question Albert Pujols on Friday, Albert had his revenge on Sunday of Memorial Day weekend in Chicago, blasting 3 home runs deep into the bleachers and on to Waveland Avenue. 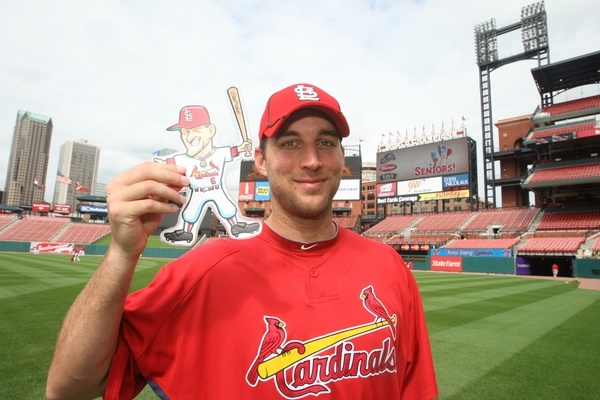 Wainwright knew what to do with that kind of lead, throwing 7 innings of 1 run ball and sending Cardinal fans home happy. 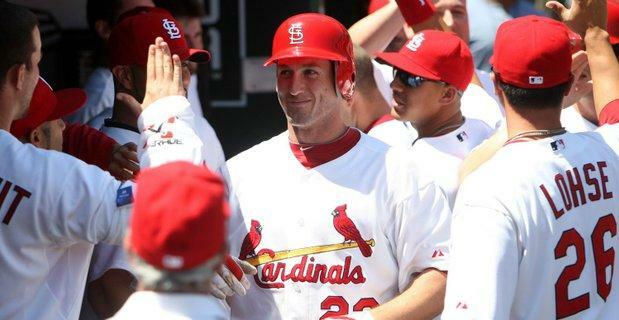 David Freese also got in on the fun, going 3 for 5 with 3 RBI’s and a home run. How did Waino choose to follow up his Memorial Day weekend game mentioned above? How about a his first complete game – a 9 strikeout, 2 hitter vs. the Brew Crew? 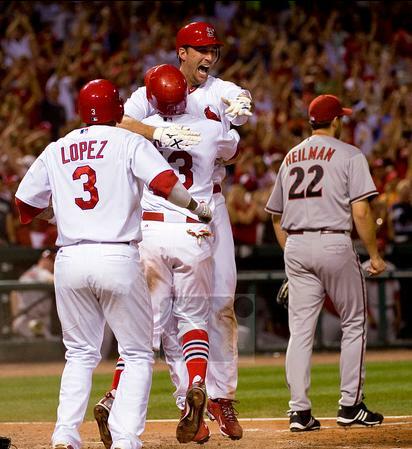 The Cardinals were patient, tossing runs on the board in 4 different innings and putting up 5 runs on starter Randy Wolf and 3 on relief pitcher Jeff Suppan. 3 days later the Brewers released Suppan and… oh wait, this is the happy section. Moving on! Mark this down as the day Nick Stavinoha broke Trevor Hoffman. In a game that the Brewers had seemingly been running away with since about the 4th, Cardinal fans had felt little reason to cheer coming into the 9th, save a Matt Holliday home run in the 6th that went farther than any other regular game home run I have ever seen at Miller Park (Yes, I was there). When Hoffman came trotting in for the 9th, it felt like game over. A walk to Colby Rasmus gave me a little hope, but then two warning track shots by David Freese and Yadier Molina left the Cards down to their last out, and pinch hitter Stavinoha trotting to the plate. Who could have predicted Stavi golfing a shot from his knees deep into the left field bleachers?! Miller Park went silent, and I went crazy. Poor Trevor Hoffman went into a dive, blowing 4 of 5 save opportunities. Brewer fans still haven’t forgiven me for being at the game where it all went downhill. We’ve had some ups and downs with this Cardinals team. By the end of the season, we’re hoping that the good outweighs the bad. We’ll find out! Game time tonight is 6:05. Go Cards! Not a lot of pictures to be found this week (maybe the photographers all took the week off?) 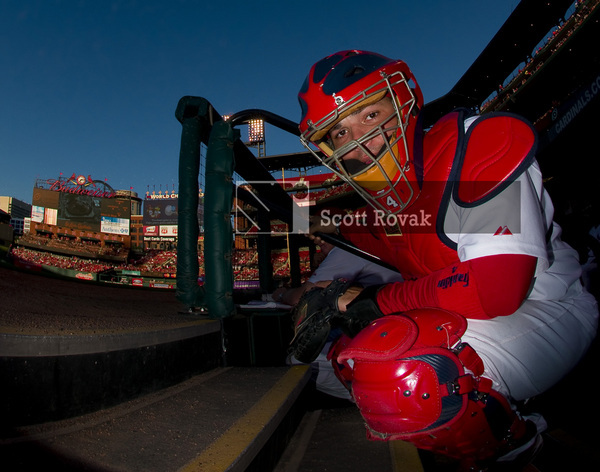 so as an added bonus we’re bringing back Erika’s photos from her trip to Busch that she posted earlier in the week. Enjoy! 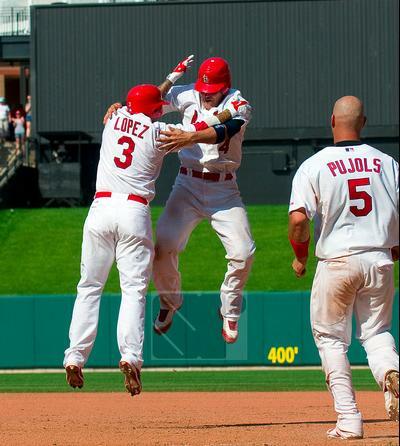 We love seeing the boys happy – but why didn’t we know Yadi could jump that high?! Walk-off single? That’s a winner! Would we give back this grand slam if it meant Penny wasn’t hurt? Yes. A frustrated Holliday is still #chickcomment worthy! Unsportsmanlike conduct! 15 yards from… oh wait, wrong sport. In baseball, he’s just a jerk. No words for this. Just laughter at LaRue’s funny face. We’re still new at this blogging thing, which is why I think this is the first time any of us have ever completely changed course after a game. My plan was to write about Aaron Miles, but that’ll have to wait for another day. I crack up when pitchers hit big home runs. You never see them coming, and half the time the pitcher is just as surprised as you the fan are. Brad Penny, before last night, had not hit a home run since 2003! So forgive me for still being giggly when I saw the Fox Sports Midwest commercial break cut back to the game prematurely and players, Tony LaRussa and Barry Weinberg (the Cardinals trainer) are all wandering the field. That’s never good, and my euphoric feelings were flushed away when I saw Penny heading down the dugout steps. Hurry back, man. (no pun intended… okay maybe pun intended). Safe to say the Cardinals are making a move. The immediate reaction was to put PJ Walters on a plane to St. Louis, and to that I say excellent. PJ has had a rough year in real life, but has had a very nice start to the season, so I was hoping he would be the one to get the call. The question I have seen is which pitcher gets shut down – Penny or Blake Hawksworth, who is nursing a sore groin that also troubled him in spring training. First of all, yes I am being a Hawk apologist here to say that I’m glad there was a reason for his recent struggles. Despite his claims that the groin only bothers him when there are men on base and he quickens his motion to the plate – the fact is still there that it bothers him. He obviously needs to rest a few days and re-evaluate, which is what the Cardinals were planning to do this weekend with Monday’s looming off-day. However, I fully expect Penny to be the one that is shelved, assuming the Cardinals only make one move. Should the Cardinals make a second call to Memphis for a relief guy? Glancing quickly at the Memphis stats, the only relievers that are standing out in any way are Rich Rundles (WHO???) and Oneli Perez. Josh Kinney and Rich Hill, our two in the Memphis pen with the most major league experience, have been less than stellar this year. Therefore, my answer is no – there should not be another phone ringing in Sacramento (Baby Birds are on the road right now) today. Obviously the next two games could be a grind. 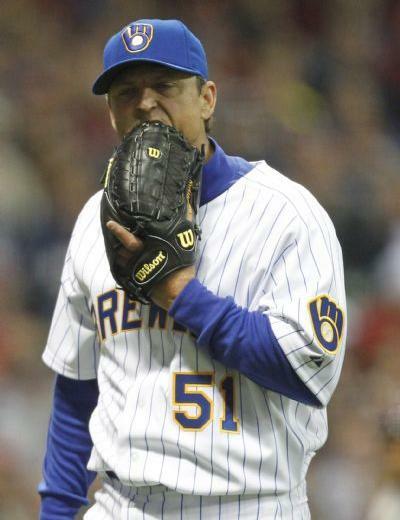 With Kyle Lohse starting today, Mitchell Boggs and Jason Motte each going 2 innings and Trever Miller and Ryan Franklin as the only two that didn’t see action out of the pen last night, the pen is stretched. Now, thankfully Walters was scheduled to start today for Memphis. I imagine if Lohse has a rough game, Walters will get the call to mop up the rest of the innings, giving the pen a relative day off. Today’s game will be an interesting one to be sure, and we’ll see where we stand at day’s end. The Cardinals finished April with a 15-8 record (although it should likely be 16-7, since last night’s game should have been stopped for a rain delay when the Cards were winning 2-0). Regardless, the Cardinals have a three-game lead over the Reds, the only other NL Central team with a winning record at 12-11. They also are tied with the Padres (anyone else surprised?) for the best winning percentage in the National League, .652. Enough numbers. 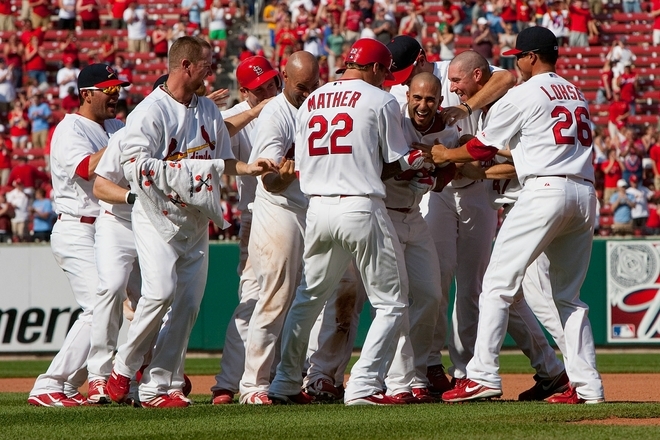 April was a great month for the Cardinals, with many memorable games and exciting moments. Yes, there were eight losses that also are memorable – to distract myself while running this morning, I tried to remember each of them and could easily recall seven. (The only one I couldn’t remember details of was one I didn’t see at all, the Astros first win of the season on April 15.) With one month down, here are my highlights of the past four weeks. Obviously, with the way Jaime pitched during spring training, we knew he deserved his spot in the starting rotation. Yet did anyone expect he’d do this well? (Hoped he would, sure – but expect it?) He leads the starting rotation with a 1.04 ERA, has allowed no home runs and showed considerable poise in pitching against top-of-the-rotation starters Yovani Gallardo, Johan Santana and Tim Lincecum. It’s a joy to watch him every time he starts. Brad Penny – Tough break for him last night. (Thanks, umps.) He’s been outstanding. Colby Rasmus – He’s currently leading the National League in on-base percentage and OPS and is second in slugging percentage, has six homers (love those Colby jacks!) and – amazingly – 17 walks. Another fun guy to watch, game after game. The bullpen – Everyone’s biggest worry going into the season had a terrific month. The reliever with the highest ERA is Joe Mather. (Ha!) Behind him is Mitchell Boggs at 4.00. Ryan Franklin is seven for seven in save opportunities, and Jason Motte got a save the other night. Overall, Cardinals pitching has the best ERA in the National League, 2.65. He’s struggled both at the plate and on the field. He temporarily boosted his luck by adopting Brendan Ryan’s high socks Wednesday night and reached base four times, with two singles and two walks. But on Thursday he was 0 for five and yesterday was back to the regular socks once again. He has three errors at second base (I actually thought he had more) and hasn’t always looked as skilled and sure handling the ball as he did last season. Brendan Ryan – The CDD favorite has had a very rough month at the plate. Hopefully a new month will mean better production for our Brendo! Albert’s strikeouts – He had 14 strikeouts for the month, compared to 13 walks. A week ago, it was hard to watch his at-bats. However, since he’s Albert, he’s turned things around. The Cardinals home opener is always such a goosebump-inducing event with the Clydesdales and the Hall of Famers and the parade of players before the game. Add to that a victory featuring Albert with a homer and four RBIs, Ryan Ludwick going four for four and Adam Wainwright pitching eight scoreless innings – yeah, best game of a month filled with many good ones! It’s been a good month when there’s no blow-out loss that automatically stands out. The April 20 loss to Arizona (when the Cards kept scoring, but then giving the runs right back and Dan Haren went four for four at the plate) or last night’s loss to the Reds (especially all the chances on offense they couldn’t capitalize on once play resumed) tie for the worst game. Note to my friend Michael: SKIP THIS! The 20-inning game on April 17. Yes, it could have been managed better (and thus has provided much fodder for the La Russa haters of the world). Yes, Felipe Lopez is now on the disabled list because he pitched the 18th inning with an already sore elbow he didn’t tell anyone about beforehand. Yes, even a mention of the game still infuriates my friend Michael two weeks later. But that afternoon and evening provided so many of the reasons why we watch and love baseball – to see things we’ve never seen before. Lopez pitching. Mather pitching. Kyle Lohse playing left field. Yadier Molina momentarily breaking Mets’ hearts yet again with a game-tying single in the bottom of the 19th. I still marvel at that game and all that happened throughout those nearly seven hours. And now to build on a successful April into an even better May! Brendan makes a diving stop. We could watch him do this alllllll day. Easy Albert. It wasn’t a great call. We know. Thankful Albert. We’re thankful for the home run too. I gotta get me some of them shades, man. Brad Penny admiring Carp’s fashion. I’ma get you. Brendan didn’t have to work too hard to chase down Bengie Molina. Bengie is a big boy. Signs of a good night. RBI base hit? Check. Dirty jersey? Check. We love Yadi! 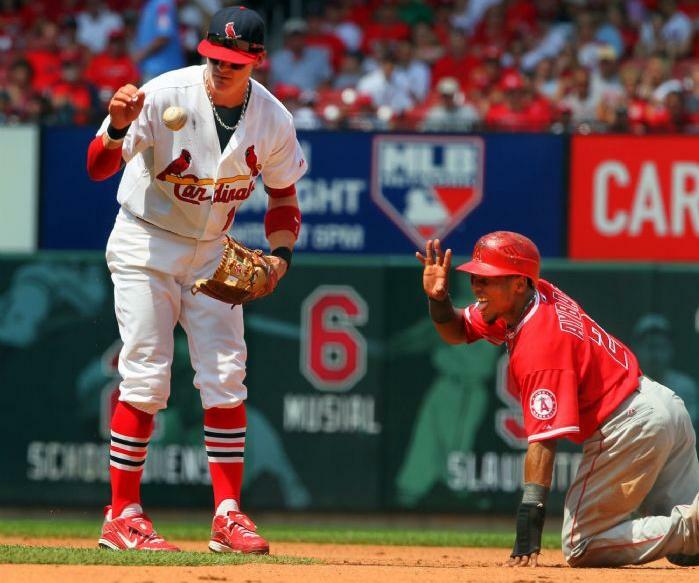 Welcome to the majors, Jon Jay. Don’t worry, this won’t be your last at bat. This picture is just sweet. 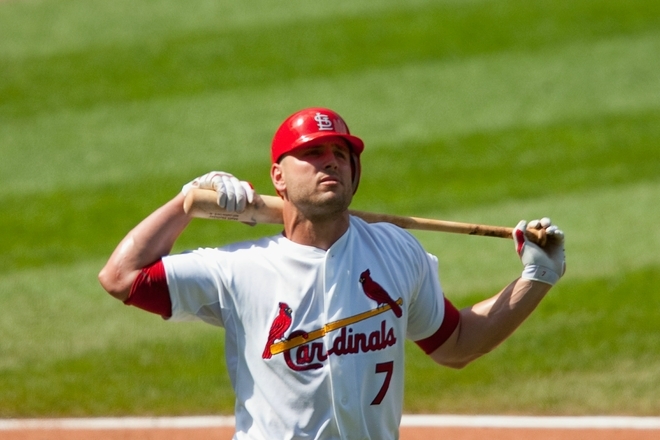 Matt Holliday connects for a broken bat base hit in the rain. Happy birthday! 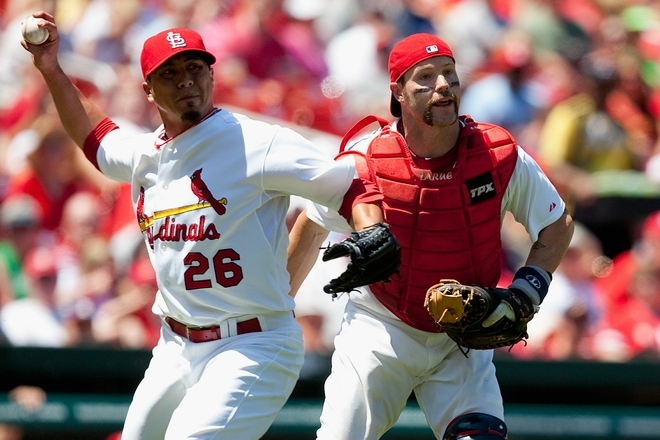 Which present was better: Yadi’s hit or Motte’s save? Speaking of saves, this one was pretty good too. Can’t forget Luddy. He came through when needed too. Because it’s his birthday, Carp gets two pics. This is our all-time fav! If we had to, we would nominate this as the official photo of the CDD. Getting dirty. 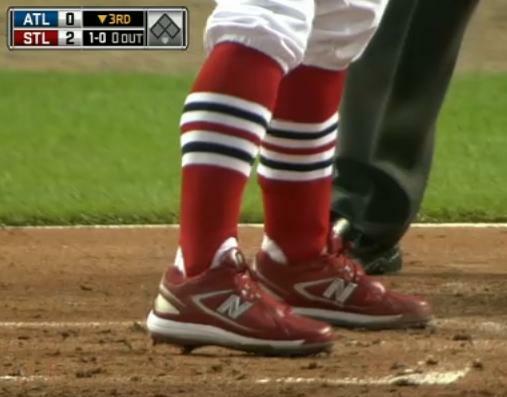 The high socks were a hit for Skip Schumaker, who broke out of a slump and got on base 4 times last night. Chilling in the dugout. Is there room for us on that bench? We want to know… what is Jaime throwing here? Fastball? If so, which kind? Final stamp of approval on this week: We approve of Skip’s socks from last night. Well done, Skippy.